I am joining Susan at Between Naps on the Porch for Tablescape Thursday and the Fall Party at Rhoda's Southern Hospitality...Thanks for hosting dear ladies.. 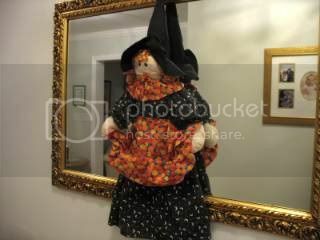 I am not fully decorated for Fall...just bringing out things little by little. This lantern is from WSonoma Outlet...last year.. I will have to catch up with the rest of you who are fully decorated...I am still trying to find all the Fall bins in the basement!! That amber bubble glass pitcher I got in the Pfaltzgraff clearance center 2 yrs ago...it was marked 24.99, but I got it for .96 cents!! The fall colored napkins have leaves on them, and I wired faux squash and leaves to a napkin ring.. I filled a hurricane with mini faux pumpkins, orange candle and surrounded it with a leaf garland..added more faux squash and acorns.. The amber wine glasses are from Villeroy and Boch.. I cut the butter with an acorn cookie cutter, and made the biscuits in a pumpkin mold. 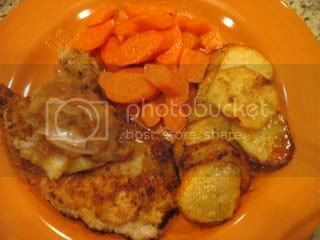 Dinner was pork cutlets, pounded dipped in milk, then panko and fried..
Parmesan potatoes and glazed carrots...apples simmered in apricot brandy for the top of the cutlet.. I painted the acorn cut outs with chocolate.. 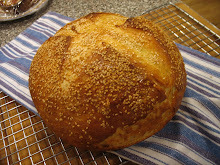 The recipe is very good. If you like a custardy filling though, use a different recipe. 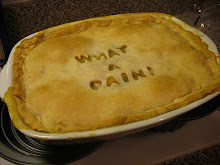 Would I make this again, (that is the test for me..) yes! I sure could have used Sue at Sullivan and Murphy's acorn salt and peppers for this table. 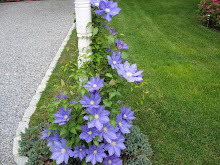 Go see her decos..she has really gone all out..just beautiful! Thanks for visiting....I do appreciate it! I just love all your different pieces - your tables all look so homey and inviting! The pork cutlets fit the bill perfectly and the pumpkin pie is too cute! Your fall dishes are so pretty. It looks warm and cozy, just the thing for a cool evening. K, you have the best tablescapes! I love the little acorn bowls. 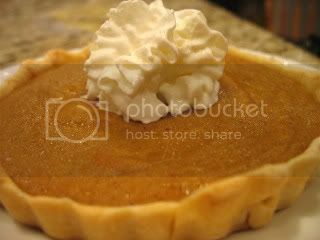 Your pumpkin pie looks delicious...it is one of my favorites. Once again Kathleen...you Amaze with Each Table & Menu. Everything is Perfect. I've said it before... 'Move Over Martha Stewart'!! It does look like Fall at your house! Now I know what you were doing all day. ;-) It all looks beautiful. I think all your fall touches are precious. I especially like your scarecrows. Oh yeah--I see the school teacher coming out! The front door is a dead giveaway! This is beautiful--love the biscuits and butter. All your details make it perfect! Attention to detail. Right down to the butter. Lovely. Your dinner looks delicious. I like that there is food involved in this tablescape. 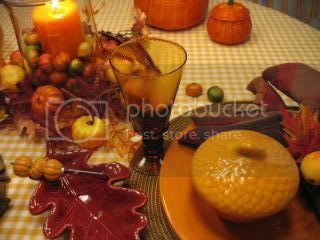 I love your beautiful fall tablescape. Everything looks so pretty. That front porch looks fabulous...so fallish!! Wow!! I bet the little ones love the front so much! Man have you been busy! New wall paper, new banner,outside decorated, table set, butter pats to match, muffins, dinner AND a pie! Do you sleep???? I love it all. I particularly love the lidded acorns. They are adorable. Your tablescape is so warm and inviting. 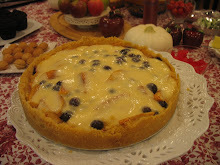 Very cute pumpkin pie, I love it. Your table is beautiful with all the fall details. So pretty. Lots of layers and textures and fine details. Dinner looks yummy. Kathleen, what a great table! I am so green with envy right now since I can't grab my accessories from the storage. Love all your pieces and that pie is delish! Your table is beautiful. That dinner looks absolutely wonderful! Your table is SO very pretty. Love the idea of adding touches to the napkin rings! Your meal looks and sounds DELISH! Your fall decorating is so beautiful! 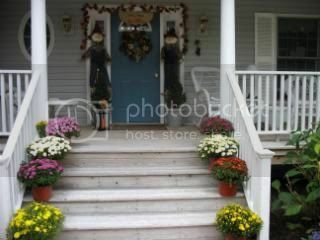 I love it, especially your porch and steps, I love fall mums. Hugs, Cindy S.
Leaf me alone - LOL! Your table is beautiful, Kathleen! I love the acorn butter and pumpkin-shaped biscuits. Beautiful tablecloth too. I feel like such a slug with my fall decorating but it's October so I'd better get with the program! Great tablescape, Kathleen, and fabulous accessories ... 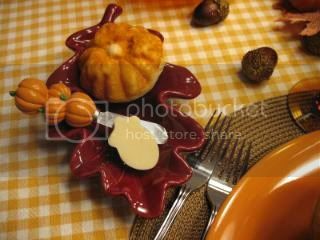 I love the Pfaltzgraff leaf plates and acorn bowls ... Those are fantastic and perfect for the season. Another well-planned and adorable table. 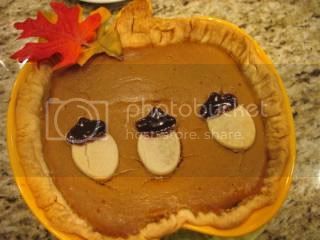 What a darling pumpkin pie ... the chocolate-dipped acorns are perfect for the pie. Thanks for the birthday wishes and good luck. I love the amber goblets, the leaf dishes, the ckeckered tablecloth and the centerpiece. Talking about details for a tablescape; yours Fall right into it. This is lovely and everthing is so pretty and the colors that you use tells me fall is at your home today. Love your fall table. I haven't gotten out all my fall items because its still so hot here. 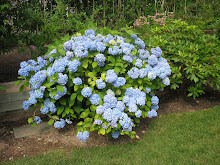 Thanks for sharing and have a great day! Very pretty! The food looks and sounds so good. It's all SO delightful! !Thanks for sharing. Kathleen, I love it all! From the welcoming front door to the beautiful tablesetting, the scrumptious meal and the perfect dessert. Your tablesettings always make me smile...you are so talented putting them together so wonderfully. Your delightfully beautiful table looks oh so cozy with that gingham tablecloth! You have done a great job decorating so far, Kathleen! 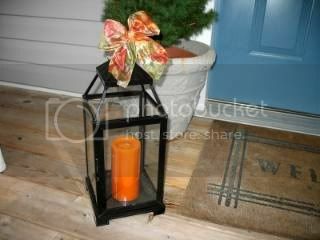 I adore your front porch...never mind your cute fall stuff!! lol!! 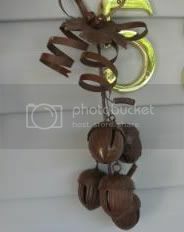 Really, I love the mums and scarecrows and the acorn bells are so cute!! Your tablescape is perfect for October 1!! I love the acorn soup tureens. The menu sounds delish. I love those panko bread crumbs. I have made chicken with them. I'd like to try the topping with the apricots (was it apricots?) and brandy. Have a great weekend and Happy Fall Y'All!! Your front porch is very beautiful. I loved the place setting, so many warm colors. Great job. Beautiful!!! The entryway to your beautiful home is fabulous!!! You really went all out and I love it! 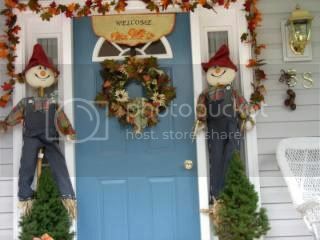 Love all the pretty pots of mums trailing the steps and your front door decor is soooo Fall festive!!! Now this autumn table is just gorgeous too! 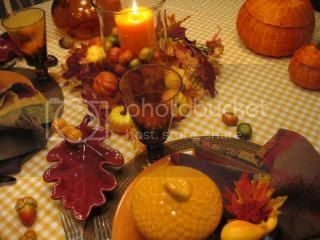 Love the pretty checked tablecloth...the perfect backdrop for your autumn place settings! My friend, I love those orange plates...so pretty against the brown woven mats! And your dinner napkins...I love! I just go "goo-goo" over these beautiful autumn plaids! Hehe! They look so pretty on top of your orange plates though! Love the little covered acorn bowls too! 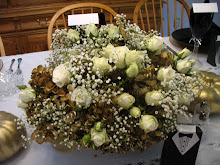 Beautiful centerpiece...my friend, you are so creative! Thank you for sharing your fabulous Fall table with us today! OMG...love the pumpkin shaped biscuits and acorn shaped butter pats...Girl, you've really outdone yourself!!! Warmest wishes and Happy Fall! WOW...your fall decorations are lovely!! The little guys that welcome you when you arrive is fabulous!! Thanks for the scrumptious pie and those yummy potatoes!! Love your table, Kathleen. It is so creative, festive and downright lovely! I've been up to my armpits in paint all the live long day. I am so so tired and my room is NOT looking ANYthing like I wanted it...back to the drawing board..bwaaaa..ever have plans that just fizzle ?? Very good. Enjoyed seeing your decorations and how you did your lovely table. Kathleen! Very fun. Love it all. That is just a sneak peek of your front door, right? I love the acorn covered bowls!! Did you get great deals on everything from Pfaltzgraf or what? 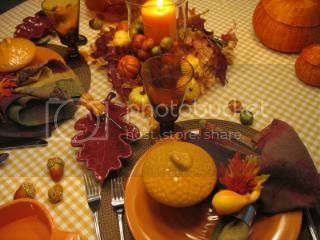 Your menu looks fantastic and so does your Fall decor! Your front porch is simply beautiful, as is your tablescape. Your dinner looks delish. Beautiful fall colors. The pie is adorable. 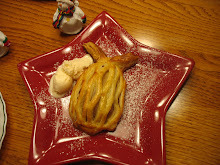 My assignment for Thanksgiving dinner is pie - I'm definitely going to duplicate your acorns - too cute! 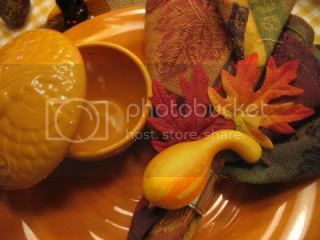 Love the little pumpkin pie dish...so cute. And although you did not mention the napkin rings, they are gorgeous! I'm enjoying all these Fall tablescapes, thanks for joining the party. Your's is beautiful! Hi Kathleen- Thanks for the shout-out on the little acorn salt and pepper shakers and my decorations! Yup, they would have complemented your tablescape very nicely. All your pieces of Pfaltzgraf, Dollar Tree, and Homegoods dinnerware are so pretty- Everything is so nicely put-together! And the menu.... oh I want to start cooking those heavier, heartier meals- so welcoming and satisfying. Your table says comfort and beauty, Kathleen. You're a very talented lady! What a lovely tablescape matched by a wonderful meal. 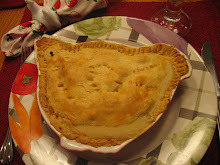 I really like the pie recipe and appreciate your sharing it with us. I hope you are having a wonderful day. Hello Kathleen - what a beautiful table scape! I love those acorn covered bowls. Very sweet. And the way you've decorated your front porch is so warm and welcoming! Thank you for sharing. Kathleen...your table is stunning. Those little acron dishes are too, too cute. And to top it all off, your meal looks soooo goooood! Thanks for sharing! 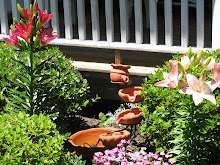 Your acorn bowls are so cute and I just love all those mums that are lining your steps! What a festive & fun porch area you have! Your tablescape is absolutely gorgeous! The food looks delicious, too! 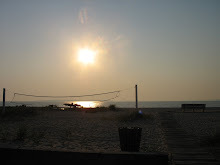 Thanks so much for stopping by and making the rounds of my silly little blog! You know you're making me really hungry. That pumpkin pie makes my want to go outside and pick a pumpkin to bring home and eat. I eat them with butter and cheese. I know... I'm weird. 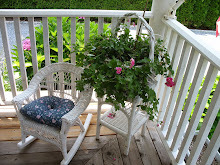 Your porch looks beautiful. I've done absolutely nothing at home for decorating. Pathetic! Oh everything is so delightfully fall! I especially love your acorn bells on your door, those are simply adorable. Love your fall table. I have been playing catch up and didn't get mine done in time. Your pieces are outstanding... and you just crack me up with the bargains you get. I need to be on your overflow list... You could even turn a profit on me...;) Do you cook a full on dinner every night? I "have" to know the answer to this question. Have a great day. I enjoyed seeing your leaf theme! You have some neat pieces! Oh my goodness that little pie is so cute! I love it. Your place looks great decorated for fall. I'll make Randy dig out Halloween this or next weekend. I am loving fall this year. Thanks for joining me for the Flashback! Beautiful! I want to shop with you. I cannot believe the bargains you find! Boy, you make me wish we had a Pfaltzgraff outlet nearby! Wonderfully interesting accessories to your pretty tablescape. 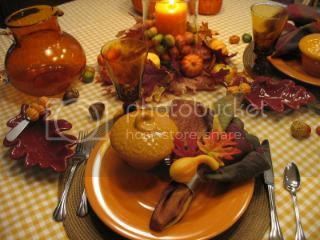 What a fun "leaf" me alone tablescape! Love the color and dinner looks mighty tasty! Kathleen, everything looks so pretty! Your table and the pumpkin pie and all your decorations are really very autumnal. How I wish I lived closer to the Riverhead outlets! Have you visited the new outlet center in Deer Park? As always, the food looks delicious, but I am swooning over the dishes and everything in your 'scape. It's so warm and cozy and inviting! I'm trying to work up my never for cupcakes. Shaking in my slippers! It sure is beginnig to look alot like Fall around your house! It's beautiful! 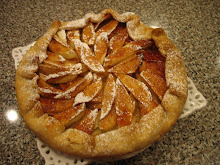 I think I would like your recipe for Pumpkin Pie, and your dishes are so gorgeous! I love Fall, too! 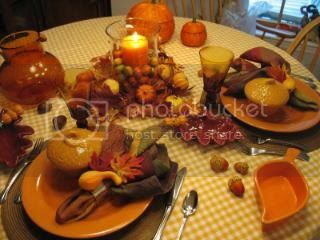 Hugs, Cindy S.
Your tablescape is just beautiful--so inviting and warm! Of course, the food looks delish, as always!